A lot has happened over the last few months here in Iowa in the fight to defend the Second Amendment. With so much going on, and with so many new gun owners joining our ranks, please read this overview of where we stand as the legislature convenes in just four days — then take action! No legislative year in the Capitol occurs in a vacuum, but rather as a continuation of the year(s) that came before it. Never has that concept been more true than today, as we gavel in the 2017 session. You see, for years, Stand-Your-Ground and Constitutional Carry legislation were bottled in the Senate. You all know that. Despite having 24 of 26 votes in the Senate for the last 2 years, Stand-Your-Ground law wasn’t even allowed a sub-committee vote — much less passage in the Senate. The same was true of Constitutional Carry. As state after state has moved these major pieces of legislation, Iowa was at a standstill, having passed nothing substantive in years. Anti-gun senators bet the farm that they could set their face against the Second Amendment, betray gun owners, and get away with it. During this time, other well-meaning but misinformed groups tried to wrangle a deal from former Senator Gronstal and others, trying to scratch out a piece of freedom here and there. And this confused gun owners. This confusion was made worse when these other organizations fell completely silent during the election season — allowing these anti-gunners to get away with it. Of course, Iowa Gun Owners knew that the ONLY response to this had to be giving gun owners the information they needed to extract retribution at the ballot box. With your help, we’ve done this every election year since our founding, seeing 35 anti-gun incumbents removed from office in the House and Senate! The capstone of these efforts, of course, was the putting the Iowa Senate into the hands of pro-gun legislators for the first time in many years. Now that we have a pro-gun majority in the House and Senate — and a Governor who’s been solid on the Second Amendment — we have to take advantage of it! Too many legislators in Des Moines have grown accustomed to walking softly around the gun issue, always saying that “Gronstal will kill it,” and then simply giving up. So instead of repealing the silly law that makes you a criminal to allow your 13-year-old to shoot a handgun, they’d simply lower the age two years and call that a victory. Instead of fighting for Stand-Your-Ground law, these legislators would work on allowing concealed carry on an ATV with a triple retention holster, and call that a win. Don’t get me wrong, these were certainly small steps forward. That’s exactly the point — they were small steps. 2017 needs to be a year of big leaps! We can’t allow legislators to fall into old habits of doing the bare minimum and calling it a day. They have this majority because of the work of gun owners. Now it’s time that they do what they’ve always said they would, if they had the numbers. 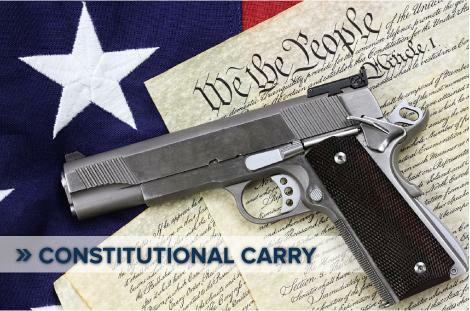 Simply put: you and I can not allow them to pass little pieces of legislation while not touching Constitutional Carry and Stand-Your-Ground law! As we gavel in next week, we’ll be giving you constant updates so you know when to call and email your legislators — insisting that they cosponsor these bills. In the meantime, I hope you’ll sign your petition in support of Constitutional Carry legislation right away! We need to make sure we have as many signed petitions as possible, to show the legislature how much grassroots support this legislation enjoys. Even if you’ve done this before, we need you to do it again as we’re kicking off a new year. Once you’re through, I have to ask you to consider a generous contribution to help us launch our program in 2017 to mobilize as many gun owners as possible. Whatever amount you can afford is greatly needed at this critical juncture, and will go right to the fight here in Iowa. Please do whatever you can, right away! After eight years, and thirty-five anti-gun legislators in the House and Senate kicked to the curb by gun owners, you and I are right on the edge of passing major pro-gun legislation. But it won’t happen if we settle for crumbs! And it won’t happen if you and I fail to remind our new majorities that gun owners brought them to the ball and gun owners expect to see them keep their campaign promises. This is our time to make it happen! P.S. You and I have fought hard for eight years to advance Constitutional Carry and Stand-Your-Ground law — and to punish those legislators who opposed us along the way! Dozens of anti-gunners have been booted from office along the way, culminating in the flip of the Iowa Senate in last November’s elections. Now isn’t a time for baby-steps, we can’t settle for crumbs. Gun owners have earned the right to see these bills passed into law. Don’t settle for anything less. And please, sign your petition today in support of Constitutional Carry legislation! Thank you for your continued support of the Second Amendment!